Hey Pueblo, Where’s Your Car? The odds of having your car stolen in Pueblo, Colorado are higher than they would be in New York City or Los Angeles. Pueblo County, estimated 2016 population 159,000, recently took on a more decidedly big-city feeling when it was declared the No. 2 place in the United States to get your car stolen. “Wait a minute! Pueblo, Colorado?” you say. “Don’t you mean Denver?” Nope. The modest city and county of Pueblo, according to the National Insurance Crime Bureau, trailed only Albuquerque, New Mexico, for the largest theft rate for its population size. Pueblo recorded 1,325 thefts in 2016, or statistically speaking, 899.43 for every 100,000 residents. That’s almost 1 stolen car for every 100 people in the county. The NICB based its analysis on raw numbers collected from police agencies and published annually by the FBI’s Uniform Crime Reporting program. Albuquerque took the lead with 10,011 car thefts, or 1,114.01 stolen cars for every 100,000 people. The New Mexico city and the surrounding region had 909,906 residents in 2016. You don’t want to park your car on a California street. The state has six of the top-metro areas. 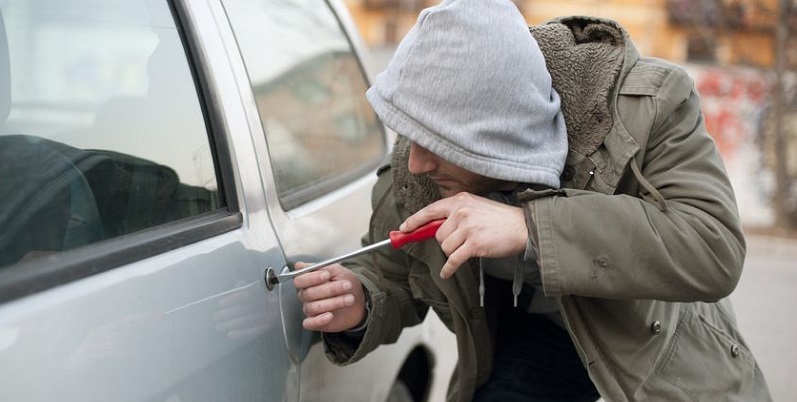 Surprisingly, cars are relatively safer from theft in New York City’s metropolitan area (No. 292) than in the Buffalo area (No. 258). Even if you’re not behind the wheel, you could be held liable in some courts for damage and injuries if a joy-riding car thief were to be involved in an auto accident. If you ever allowed the taker to use the car in the past, then an injured party’s attorney might argue that it was a case of “permissive use.” A plaintiff might urge a similar case if the car “thief” takes the keys from a common or shared area where you left them. And to whatever degree, car owners might be held liable if they fail to secure the vehicle or leave the keys in the ignition or an easily found location. A 1999 ruling by the Colorado Supreme Court deals with the question of permissive use. In that case, a rental-car customer allowed someone else to use the car, although the rental contract did not authorize him to let others drive. “Implied permission is considered from the perspective of the permittee,” the Colorado Supreme Court wrote in Metropolitan Property and Casualty Insurance Co. vs. Hertz Corp. In this case, the driver who got into an accident did not know about the rental company’s restrictions; from his perspective, his use of the car was permitted. And the high court agreed. About 30 percent of the cars and trucks stolen in Pueblo in 2016 were taken after the owner had left the vehicle running while it was unattended, The Chieftain reported. Police also frequently see cases where the owner left a spare key in the glove compartment or console. The National insurance Crime Bureau ranked car thefts in these metropolitan areas based on the number of cars stolen per 100,000 people in the area. Pueblo: No. 2 in U.S.; 1,325 thefts; 899.43 per 100,000 people. Denver: No. 26 in U.S.; 13,278 thefts; 538.69 per 100,000 people. Colorado Springs: No. 74 in U.S.; 2,347 thefts; 329.48 per 100,000 people. Greeley: No. 107 in U.S.; 759 thefts; 273.35 per 100,000 people. Grand Junction: No. 217 in U.S.; 243 thefts; 164.69 per 100,000 people. Fort Collins: No. 274 in U.S.; 404 thefts; 121.11 per 100,000 people.